“Why do artists love books?” This volume takes this tantalizingly simple question as a starting point to reveal centuries of symbiosis between the visual and literary arts. First looking at the development of printed books and the simultaneous emergence of the modern figure of the artist, The Art of Reading appraises works by the many great masters who took inspiration from the printed word. Bringing together more than one hundred paintings that include books as part of their subject matter, this lively and companionable survey examines how the book became the single most ubiquitous feature of our cultural lives and, in large measure, of everyday existence. Authors Jamie Camplin and Maria Ranauro weave together an engaging cultural history that probes the ways in which books and paintings represent a key to understanding ourselves and the past. Paintings contain a world of information about religion, class, gender, and power, but they also reveal details of everyday life often lost in history texts—and all the more so when books are depicted. Such artworks show us not only how books have been used and valued over time but also how the significance and practice of reading have evolved in Western society. 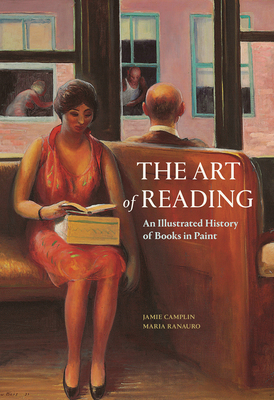 Featuring work by artists from across Europe and the United States and all painting genres, The Art of Reading explores the two-thousand-year story of the great painters and the preeminent information-providing, knowledge-endowing, solace-giving, belief-supporting, leisure-enriching, pleasure-delivering medium of all time: the book. Jamie Camplin is a Cambridge-educated historian who retired in 2013 from a distinguished career as Thames & Hudson’s editorial and then managing director. He is the author of The Rise of the Plutocrats: Wealth and Power in Edwardian England and the historical novel 1914 The King Must Die. Maria Ranauro studied art history at the Courtauld Institute of Art before joining the publishing department at the National Gallery, London, where she was responsible for the visual content of a number of seminal exhibition catalogues. She is now a senior picture researcher at Thames & Hudson.